The School-Age Green Educators (SAGE) committee connects educators, parents and others who work with school age children (K-12). We provide networking opportunities and access to green resources and specialists in our area across a variety of learning domains. Through networking and professional development activities, SAGE provides opportunities for individuals and organizations to learn from each other, as well as from experts in outdoor and environmental education. New in 2019! Get in conversation with other educators and parent volunteers through this virtual community. SAGE offers social opportunities for educators to connect as well as Meet-Ups at schools, gathering places and field trip locations. Come to meet other parents and educators, to tour schools, to share experiences and get new ideas and inspiration! 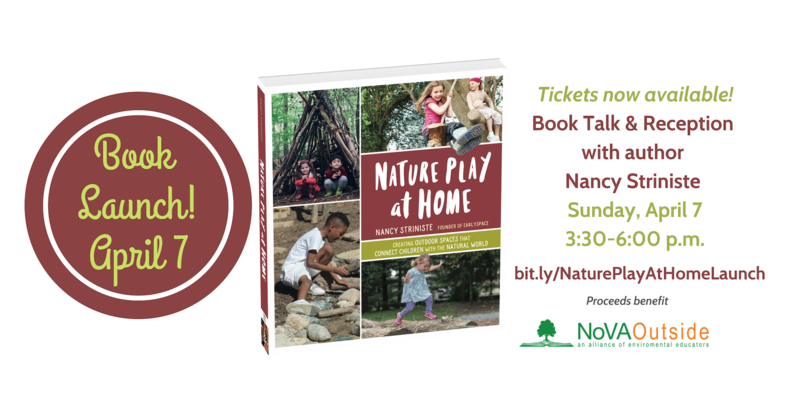 Don’t miss the April 7 Book Launch of NoVA Outside leadership team member Nancy Striniste’s new book Nature Play at Home: Creating Outdoor Spaces that Connect Children with the Natural World. Enjoy a presentation and networking reception. Tickets available now. Event proceeds benefit NoVA Outside. Educators, parents and agency representatives from around Northern Virginia and DC met for an evening of connection and sharing. Check out the recap. We learned about the journey Woodley Hills took to establish a sustainable community garden and an outdoor fully functional learning space. Terraset’s Jann Canestra shared some of the school’s many outdoor learning and gardening projects. These projects include hydroponic gardening, vegetable gardening to supplement the school’s salad bar, end of the year farm market/garage sale where the students make their own products to sell, raising chicks and ducklings, and a weekly ‘green hour’ for students in all grades. This meetup included a tour of the Tuckahoe Discovery Schoolyard that was created 20 years and included time for educators and parents to share best practices, challenges and successes. Images here. February 2018: Spotlight on 4-H Outdoor Explorers program at Arlington’s Randolph Elementary . This SAGE Meetup featured the 4-H Outdoor Explorers program. 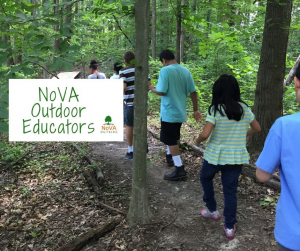 Run through Virginia Cooperative Extension’s Arlington office, this afterschool series pairs volunteer teams with youth to explore the great outdoors. Volunteers lead exciting, hands-on activities with the club each week for six weeks. Students go on scavenger hunts, search for birds, play in the dirt, and have a great time in nature. January 11: SAGE Happy Hour! at Oh George. This was a time for everyone who works with school age children (K-12) to connect with fellow educators, get ideas for your program, and find out what’s planned for SAGE this spring. Based in Alexandria, Virginia, the River Farm Cooperative offers a dynamic elementary education program for children in grades K – 6. This nature-based, cooperative program is based on the premise that both parents and children are integral parts of a school community of lifelong learners. Come learn how River Farm Cooperative has incorporated nature journaling, natural materials printing, gardening, construction of a bug hotel, and a field trip to Huntley Meadows into its curriculum. River Farm parents and teachers will also share their commitment to teaching their students about social justice and their plans to link this to environmentalism in the future. This meetup was an opportunity to see how the school yard has been transformed into an outdoor classroom, native meadow, pond, and walking paths. All of these elements have been designed, maintained and mostly implemented by students. This meetup was an opportunity to learn about student lead initiatives from Marshall’s Earth Force, who were pivotal in encouraging the building’s innovative design and continue to lead the way on environmental efforts for the school. This was a social for K-12 educators in Northern Virginia who are interested in bringing “green” into their classrooms, schools and curricula.